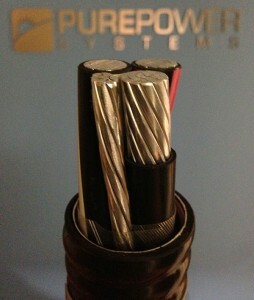 The cost savings of Aluminum conductors is too good to ignore. Both the engineer and the electrician must respect the differences between copper and the less forgiving aluminum. However, if designed and installed properly, Aluminum can reduce the installed cost and perform just as well as copper. Stripping the insulation – Extreme care must be taken when stripping the insulation from an aluminum conductor. Using a utility knife may be acceptable for copper, but it is not for aluminum. If the soft aluminum in nicked, over time those strands will break free and the lose strands will cause small shorts and sparks over the air gap of the nick, eventually leading to a failure. Wire Brushing - You should wire brush the exposed conductor to remove oxidation before applying the oxide inhibitor and terminating the conductor. This step will remove any excessive oxide from copper or aluminum wire and remove any pieces of insulation or other contaminants that might interfere with your connection. Oxidation - Oxidation is to aluminum what rust is to iron. Oxidation will increase the resistance of the connection. Anti-oxidation compound (AKA “no-ox”) will mitigate oxidation and promote a low impedance connection to the lug. Thermal Cycling – Due to the thermal cycling from day to night, the conductors expand and contract. Aluminum expands and contracts more than copper and is much softer, so when mechanical lugs are used the cable can work itself loose. Mechanical lugs should not be retorqued as part of any routine maintenance procedure because repeated tightening of any set crew mechanical lug could result in the eventual biting through of the conductor which will ultimately cause a failure of the connection. This is why Pure Power Engineering strongly recommends the use of compression lugs, which will ensure a long life and secure connection. Note: A hydraulic crimper for compression lugs runs about $2,000, but once you have the crimper the material and labor cost is equal for mechanical and compression lugs.